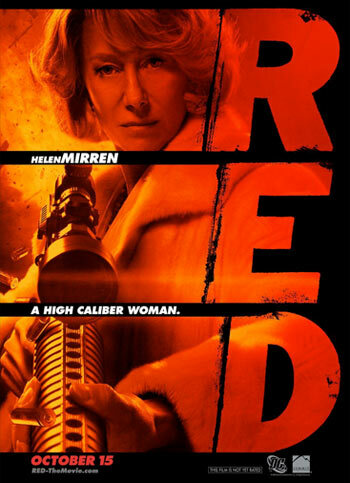 This week’s Danger Gal Friday post profiles Victoria from the movie RED portrayed by Dame Helen Mirren. The movie is based on the cult D.C. Comics graphic novel by Warren Ellis and Cully Hammer. As she has done throughout her career, Dame Mirren once again breaks down barriers for women in film and now she’s breaking down age barriers as well. Victoria is a trained MI6 assassin who worked with Frank Moses. She comes out of retirement to save Frank from the killers after him. Of the group in Red, Victoria is the one who has been able to assimilate back into society the best as the owner of a small bed and breakfast — even if that assimilation is only skin deep. Victoria is a former wet works sniper who has since retired and bought a small town bed and breakfast. But when the Agency comes calling with a hit squad, all the comfort food and frilly tablecloths go out the window, leaving Victoria to defend herself not with a kitchen knife, but a 50 caliber machine gun. RED has a love story to tell too, though. Both Frank and Victoria have to deal with their work and love lives colliding. They’ve both done what spies should never do: fall in love. The main story is about Frank’s developing love for Sarah, but Victoria is confronted with her love for KGB agent Ivan Simanov — and he won’t let her go. When their relationship was discovered years prior Victoria had to demonstrate that her loyalty to MI6 hadn’t been compromised. So she shot him. Ivan understood, though, being a spy himself and waited for years until they could be reunited. I mean, if you donâ€™t want to see a film with Helen Mirren with a sniper rifle, Iâ€™m not sure I want to know you.